Stupid Phil can be relied upon for umpteen logical fallacies in each of his columns, but sometimes he provides excellent examples of basic illiteracies as well. In this column he writes "(Yadda yadda yadda) ....policy on Iraq (sic), Kim was expressing profound sympathy for Rove at a time when the Republicans are in deep doo-doo, to borrow that splendid term of George Bush Sr. Given that Rove is Bush Jr's brain (sic)..."
Phil thinks that sic means something like "I don't agree". That is, (in the extract above) he is trying to say that he doesn't agree that there is a policy on Iraq; and that he doesn't agree that Bush Jr has a brain. Sic actually means: "the word quoted is exactly as it appears in the original". (OED). Whenever we at this blog email Phil and point out one of his illiteracies or factual errors, he gets all sniffy and always claims that a "sub-editor made the mistake". We suspect that Phil makes the mistakes, but can't admit it. Sub-editors are a convenient scapegoat. Subs are after all merely there to pay homage to the master... and to shoulder the blame for the Phillistine's crude errors. 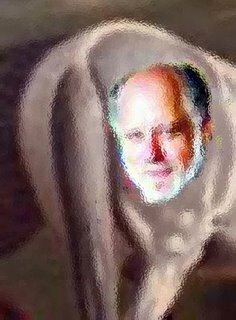 Explanation of picture: a mysterious vision of a disembodied Phillip Adams head appeared on a Horse's Arse some months ago, and I managed to snap a picture through a frosted glass stable door before the spooky vision disappeared. Makes you think, doesn't it.